Skiathos is connected with Volos, Alonissos, and Skopelos with daily ferry routes, which is a cannot-miss-opportunity for you to explore the rest Sporades islands. The ferry connection is served by conventional and high-speed boats and you can find relatively cheap tickets for your trip there. During the summer season, Skiathos is also connected with Thessaloniki, Agios Konstantinos and Evia (Mantoudi). Below you may find a brief description of the connected ports and the ferry schedules along the year. You may find all the announced ferry itineraries at any time in our ferry ticket booking engine. There is at least one daily ferry to Skiathos from Volos during the winter and during the summer season, 2 additional daily trips will be added. The journey takes less than 3 hours. During summer, there is also a ferry from Thessaloniki to Skiathos running on a daily schedule. The connection is operated usually by high-speed ferries and the trip duration is a bit more than two hours. The easiest way to get from Athens to Skiathos is through the ports of Evia i.e. Mantoudi and Kymi. The connection between Skiathos and Evia in winter is with 3 trips per week which operate daily during the summer and the duration of the trip can reach 4.5 hours, depending on the ferry type. Most of the ferries that reach Skiathos also pass by Skopelos. During summer there are 5-6 ferries per day from Skiathos to Skopelos, while in the winter there are usually one or two daily ferries serving this route. Take a minute and think “summer holidays in Greece”. If parties, sandy beaches, and blue water sea come first in your mind, then Skiathos is your island! 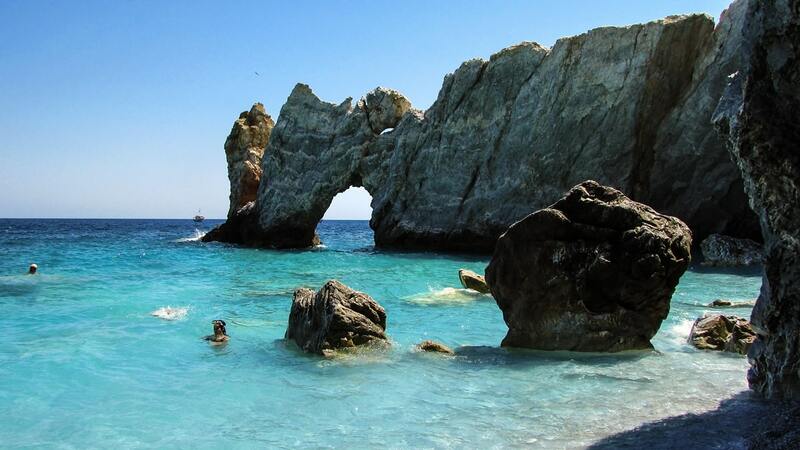 On the other hand, if hiking and finding isolated beaches make your heart melt, guess what, Skiathos is your place! What if you are interested in water sports in Skiathos? Dear surfer on this island you will find exposed beaches with offshore winds and ideal wave direction so you can enjoy your hobby, while on the other side of the island you can enjoy the tranquility while reading your new favorite book.